Dec: 23 degrees 57' 36"
This is the first light image of my new Apogee U16M camera coupled to the FSQ-106N, a perfect widefield combination. 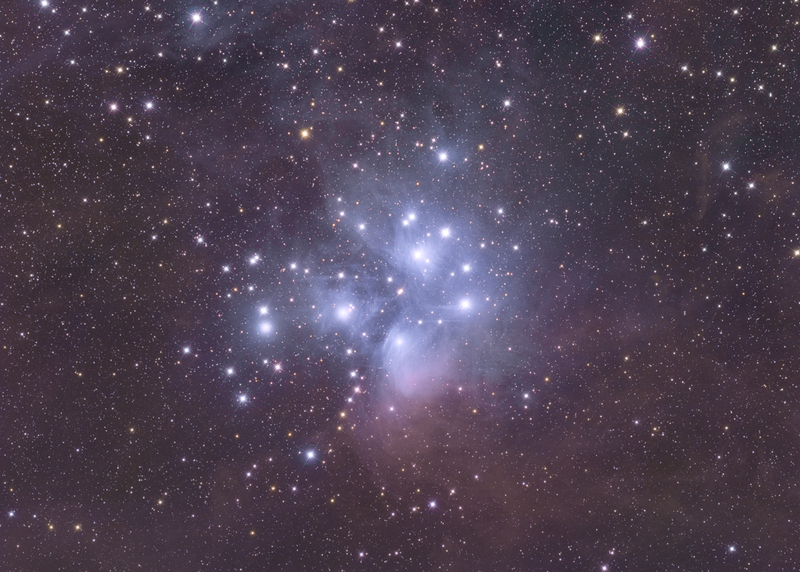 The Pleiades (M45, the "Seven Sisters") convey a sense of stately, quiet winter beauty. This open star cluster has been recognized since antiquity, with the oldest recorded observation being approximately 1000 years BC. Within this cluster, it is possible to resolve between 7-11 stars with the naked eye, depending upon seeing conditions (and eyesight!). Through the telescope, the cluster is known to contain about 500 stars that are gravitationally bound to each other. The age of this cluster is estimated to be about 65 million years old, meaning that it was "born" around the time of the dinosaur extinction. The beauty of this cluster is due to the impressive amount of blue nebulosity that appears to surround many of the stars (although is most likely not physically associated with the cluster). Many images of M45 portray the blue reflection component very prominently, often to the exclusion of the large amount of surrounding dust in the area. When I examined the luminance and red frames, it was clear that there was a large amount of dust that had a dominant red signal, and I was careful to not process this out of the image. The result is a somewhat unconventional view of the Pleiades, that shows the dominant blue reflection component in close proximity to the open cluster itself, but also captures the surrounding dust that is too far away from the cluster to scatter blue light, but which is part of the same dusty region of space. Close examination of this image shows how the blue reflection component interdigitates within the red dust, especially prominent in the upper left hand portion of the FOV. A nice description of M45 can be found on Rob Gendler's website. I am dedicating this image to the memory of Daniel Marquardt, a fellow astrophotographer who recently passed away at the age of 27. Danny was recently recognized for his achievements by the Advanced Imaging Conference Pleiades Award, making it appropriate to use my image of the Pleiades to call attention to his many contributions to this hobby. Post-processing: Calibrated, aligned, and Sigma Clip combined in Maxim, followed by DDP in ImagesPlus (IP). Further processing in Photoshop CS (16 bit format). Star spikes were added during processing using a new program by Noel Carboni (Star Spikes Pro). Although I generally don't like too much manipulation post processing, I find this program to provide excellent control over star spike characteristics, and I also like the look of diffraction spikes for certain objects like star clusters (as long as they do not dominate the image).